There are times I want to pick up the phone and call my late father. He would be so delighted (I think) with his grandchildren. He would recognize elements of his own thoughtfulness, humor, and intelligence in them. 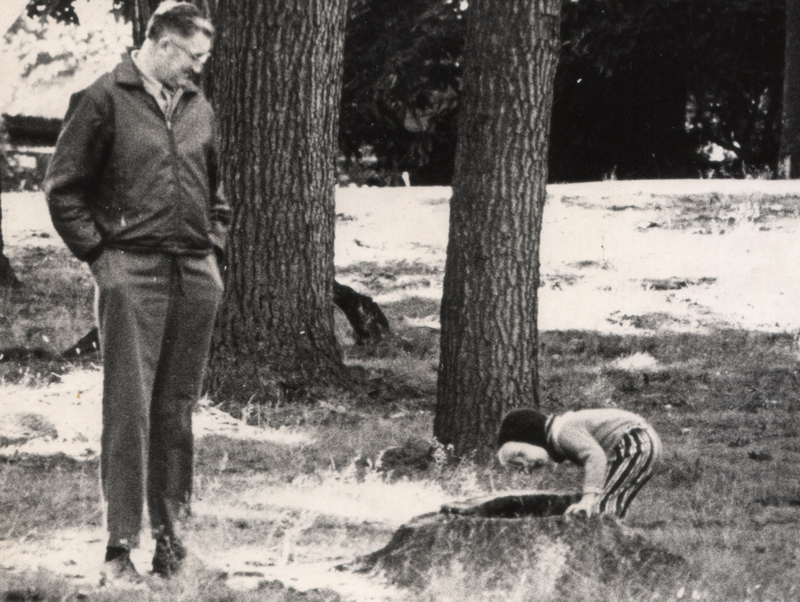 Tonight I had that feeling when I opened some pictures of my children playing frisbee, remembering the times my father would play frisbee with me. None of us sees particularly well, so I’ve played some version of catch with them since they were small, both to train their eyes and also because I think Throwing So Someone Can Catch is a very convenient metaphor for communication in general. The three of us play frisbee as often as we can, and the kids are really good at it. But I wondered: Why is it that I want to call my father rather than just sit down with him? In fact I can’t remember a single phone conversation with him. I think it might have something to do with the fact that even when he was here, he was at a remove. But I still want him to catch what I’m saying. I wrote the following story a few years ago on an earlier version of this website. The site got hacked and for a long time I thought everything was lost. But I’ve been able to salvage some things, and thought this would be appropriate for Thanksgiving week. Across the street from my daughter’s school lives a family with a productive grapefruit tree. Last week the dad placed a full box of extras outside the fence, and we grabbed a few of them on our way home. As we walked away, the mother of one of my daughter’s classmates had returned from her car with a big Trader Joe’s bag and was stuffing it. “You’re not greedy enough,” she said to us. “Hell is other people,” I told my daughter. My father, who died in 1992, loved grapefruit when he was alive (and who am I to say he doesn’t still?) and I would watch his face as he’d eat one. He’d deliberately cut it in eighths and sprinkle a little sugar on each section, then slowly eat the pieces one by one with his eyes closed. I didn’t understand why he closed his eyes. He offered some to me but I didn’t like grapefruit then, even with the sugar. This has been a painful few months. I busted my phone and I lost my wallet the same morning. I had an uncharacteristically large amount of cash in the wallet that never made it to the bank, and various bits of my identity have since traveled as far away as Russia to attempt expensive jewelry purchases. This jolt has had an unexpected advantage: I have stopped to catch my breath. And I took the opportunity to give grapefruit another try. I never thought to confirm this suspicion with my father. The following morning, before biking to work, when the house is empty, I clear a space on the table. 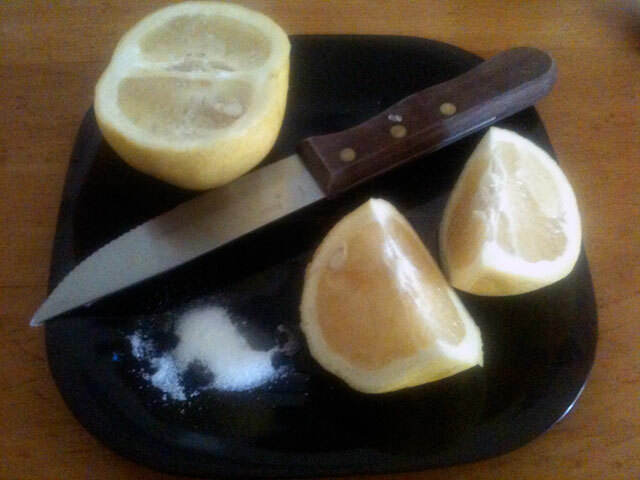 I spoon some sugar on a plate and I cut up the likeliest, most fragrant grapefruit, about the size of a softball. I use a steak knife. I push the edge of a slice into the sugar, and take a bite. It is delicious. I eat the whole thing. The feeling of wanting to call my father to tell him about it rushes over me, and it is a welcome feeling. Since becoming a parent I’ve lost sympathy for my own. For years I maintained hope that the “Just wait until you have kids” threat would give me a deeper understanding of the choices my parents made, and the way they behaved. It has, but not in the way the curse was intended. You don’t tell a child that you wish him misery, even if it’s supposed to be instructive. But that was a different time, and forgiving is a lot easier over distance, death, and the comforting knowledge that they will never, ever babysit. Still, the urge to connect with my father is like a persistent vine, and there’s places where the vine is stronger than others: when I’m floating belly up in the ocean (my father did this, my older brother tells me, because that was the only place where none of us could get to him), when I’m watching “The Sting” (his favorite movie), and now, when I’m eating a grapefruit and my eyes start to close, and the two of us are walking in the park, and I’m three. The next afternoon I get both tots together and I bust out the other grapefruit. My daughter gives it a shot but ultimately declines. My son sits opposite me, jams the grapefruit into a pile of sugar, and polishes off a few slices before he wanders off. “I just loved that lemon,” he says.